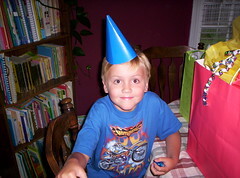 Somehow this son of mine has survived the first seven years of his life. He is smart, funny, obedient, inquisitive, respectful, and loving. He is also the happiest person I know, and I am so thankful to God, that He has allowed me to have such a wonderful person in my life. My one and only hope for his is that he will seek Christ. My heart breaks at the thought of the alternative. Sam, you are my buddy, my son, and hopefully one day my brother in Christ. Just do me one favor, stop growing so fast!